"There is another even more important preparation we must make for tests that are certain to come to each of us. That preparation must be started far in advance because it takes time. What we will need then can't be bought. It can't be borrowed. It doesn't store well. And it has to have been used regularly and recently. "What we will need in our day of testing is a spiritual preparation. It is to have developed faith in Jesus Christ so powerful that we can pass the test of life upon which everything for us in eternity depends. That test is part of the purpose God had for us in the Creation. 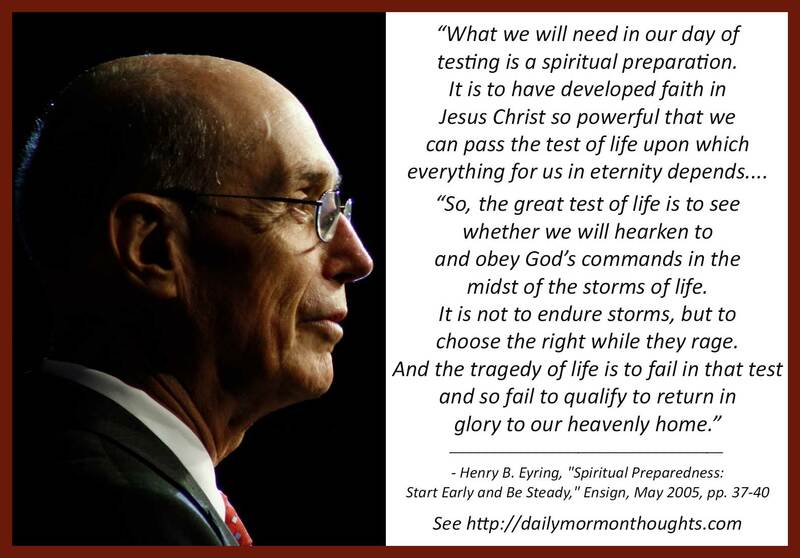 "The Prophet Joseph Smith gave us the Lord's description of the test we face. Our Heavenly Father created the world with His Son, Jesus Christ. We have these words to tell us about the purpose of the Creation: 'We will go down, for there is space there, and we will take of these materials, and we will make an earth whereon these may dwell; And we will prove them herewith, to see if they will do all things whatsoever the Lord their God shall command them' (Abr. 3:24-25). "So, the great test of life is to see whether we will hearken to and obey God's commands in the midst of the storms of life. It is not to endure storms, but to choose the right while they rage. And the tragedy of life is to fail in that test and so fail to qualify to return in glory to our heavenly home." I love the title of President Eyring's talk: "Spiritual Preparedness: Start Early and Be Steady." How blessed we are when we have that early start, with appropriate uplift and inspiration coming from the home of a child and other experiences that build on it. Then the steadiness of faithful discipleship can carry on those traditions. 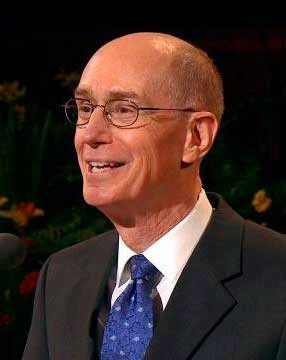 In this excerpt, President Eyring talks of the spiritual preparation that must be accumulated in order to confront the trials and challenges of life. I think this is a remarkable insight. The great test of life for us is not about surviving storms and enduring difficulties. It is about how faithful and obedient we will be when the storms and challenges are raging. God really cares much more about our faithful obedience more than whether we can just "hang on" when times are tough or "get through" the hard periods. So much depends on our spiritual preparation in the times leading up to trials and difficulties. When the need comes, the preparation is past and too late. It's the regular and recent preparation that will make all the difference in our ability to pass the tests of life.